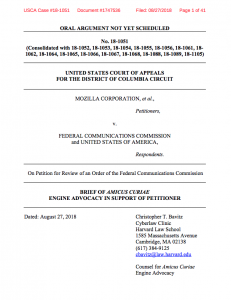 MOZILLA v. FCC |No. 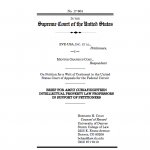 18-1051 | United States Court of Appeals for the D.C. Circuit | August 27, 2018 | The Cyberlaw Clinic filed an amicus brief (pdf) in the United States Court of Appeals for the District of Columbia Circuit, on behalf of Engine Advocacy, supporting petitioners in a set of consolidated cases challenging the Federal Communications Commissions’ rollback of Obama-era net neutrality protections. Engine—a non-profit organization that advocates on behalf of the startup community—previously filed comments and reply comments with the FCC in the runup to the 2018 “Restoring Internet Freedom Order” (pdf) that is the subject of these proceedings. The brief highlighted Engine’s prior comments and noted instances where the FCC mischaracterized, failed to consider, or improperly discounted the interests of the startup community and the harms to innovators and venture investors of eliminating clear ex ante rules against throttling, blocking, and paid prioritization. ASTM ET AL., AERA ET AL. V. PUBLIC.RESOURCE.ORG | Appeal No. 17-7035 (Consolidated with 17-7039) | D.C. Cir. | September 25, 2017 | The Cyberlaw Clinic and local counsel Catherine Gellis filed an amicus brief on behalf of members of Congress Zoe Lofgren(D-CA 19th District) and Darrell Issa (R-CA 49th District) in the United States Court of Appeals for the District of Columbia Circuit. 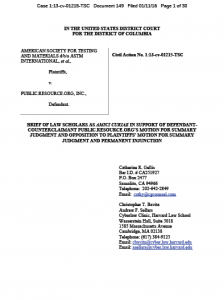 The brief supports defendant-appellant Public.Resource.org (Public Resource) in the case American Society of Testing Engineers (ASTM) et. al. v. Public.Resource.org, Case No. 17-7035 (D.C. Cir.). The appeal — a consolidation of two district court cases, both filed by standard developing organizations (SDOs) — addresses the copyrightability of the law and standards incorporated therein. The crux of the case is whether the text of applicable law may be shared freely by non-profit organizations like Public Resource. AJEMIAN V. YAHOO!, INC. | No. SJC 11917 | Mass. SJC | February 21, 2017 | The Cyberlaw Clinic filed an amicus brief on behalf of several trusts and estates law scholars and practitioners in Ajemian v. Yahoo!, Inc., Mass. Supreme Judicial Court No. SJC-11917. The brief supports the plaintiffs-appellants in the case. The Ajemian case arises out of a dispute between Yahoo and the family of John Ajemian, who died unexpectedly in 2006. After Mr. Ajemian’s death, the administrators of his estate contacted Yahoo about gaining access to his email account. Yahoo refused, claiming that the Stored Communications Act (SCA), 18 U.S.C. § 2701 et seq., prevented it from doing so. The amicus brief argues that Yahoo’s proposed interpretation of the SCA would frustrate the efficient administration of estates and prevent families from accessing troves of data with financial and sentimental value that are increasingly stored only on the servers of private companies like Yahoo. While acknowledging that the SCA protects important privacy interests, the brief suggests that the court need not read the SCA as dogmatically as Yahoo suggests, especially since the statute was written over 30 years ago and is silent on this particular issue. Steinmetz v. Coyle & Caron Inc.
STEINMETZ v. COYLE & CARON INC. | No. 16-1996 | 1st Cir. | January 24, 2017 | The Cyberlaw Clinic filed an amicus brief (pdf) on behalf of the Reporters Committee for Freedom of the Press in the case, Steinmetz v. Coyle & Caron Inc., First Circuit No. 16-1996. The brief supports defendant-appellee in the case and focuses on the ways in which the Massachusetts Anti-SLAPP Statute (Mass. Gen. Laws c. 231, § 59H) narrowly and properly protects the First Amendment interests of Massachusetts’ citizens. RCFP was joined on the brief by The Associated Press, Gannett Co., Inc., the New England First Amendment Coalition, and the New England Newspaper & Press Association, Inc.
SMALL JUSTICE v. XCENTRIC VENTURES | No. 15-1506 | 1st Cir. 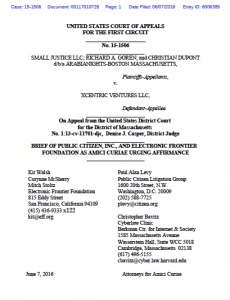 | June 7, 2016 | The Cyberlaw Clinic supported Public Citizen and the Electronic Frontier Foundation in filing an amicus brief (pdf) in the case, Small Justice LLC v. Xcentric Ventures LLC, Case No. 15-1506, pending before the United States Court of Appeals for the First Circuit. The case raises important questions about the interplay between copyright law and laws protecting free expression, including the immunity granted to platforms that host content uploaded by users pursuant to Section 230(c) of the Communications Decency Act. RODRIGUEZ v. SWARTZ | No. 15-16410 | Ninth Circuit | May 7, 2016 | The Cyberlaw Clinic and attorney Mahesha Subbaraman of Subbaraman PLLC submitted an amicus brief to the United States Court of Appeals for the Ninth Circuit on behalf of civil liberties advocacy organization, Restore the Fourth, in the case, Rodriguez v. Swartz. The case has potentially far-reaching implications regarding the scope and continuing viability of United States v. Verdugo-Urquidez, 494 U.S. 259 (1990) — in which the United States Supreme Court addressed the applicability of the Fourth Amendment to a search of a Mexican citizen’s home in Mexico — and more broadly about the extraterritorial reach of the Fourth Amendment’s protections. RIDEOUT v. GARDNER | No. 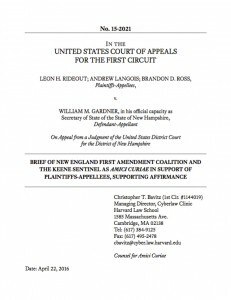 15-2021 | First Circuit | April 22, 2016 | The Cyberlaw Clinic filed an amicus brief (pdf) on behalf of the New England First Amendment Coalition and The Keene Sentinel in the United States Court of Appeals for the First Circuit, in this case addressing the constitutionality of New Hampshire’s so-called “ballot selfie” law. N.H. Rev. Stat. Ann. § 659:35 prohibits “taking a digital image or photograph of [one’s] marked ballot and distributing or sharing the image via social media.” Arguing that the statute is unconstitutional under the First Amendment, the brief notes that it prohibits many types of speech that play important roles in elections, and democracy more generally. The brief highlights specific examples of times when photographs of ballots helped the public clear up misunderstandings about government conduct, demonstrated how to ensure that one’s vote would be counted, and conveyed messages about civic participation and advocacy for a candidate that could not expressed with words alone. Spring 2016 Cyberlaw Clinic students Michael Linhorst and Jacqueline Wolpoe took the lead on this brief, working closely with Managing Director Chris Bavitz and Clinical Fellow Andy Sellars. AERA v. PUBLICRESOURCE.ORG, INC. | Civil Action No. 1:14-cv-00857-TSC | D.D.C. | February 11, 2016 | The Cyberlaw Clinic filed an amicus brief (pdf) on behalf of a group of law scholars in the United States District Court for the District of Columbia in this case brought by several standards developing organizations (SDOs) against Public.Resource.org. 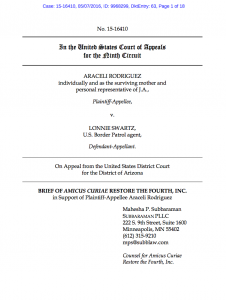 The brief builds upon a similar brief filed by the Clinic and joined by amici in ASTM v. Public Resource, Case No. 1:13-cv-01215-EGS (D.D.C. ), pending before the same court. As in the previous case, the plaintiffs in this case are organizations that develop standards (SDOs). They include American Educational Research Association, the American Psychological Association, Inc., and the National Council on Measurement in Education, Inc. Plaintiffs allege copyright and trademark infringement by defendant Public Resource, a non-profit organization dedicated to making government information accessible to the public, for publishing on its website privately developed standards that have been incorporated into federal law. This brief advances many of the same legal arguments made in the brief in the ASTM case with reference to model codes and applies those arguments to privately developed standards. COMMONWEALTH V. WHITE | SJC–1197 | Massachusetts Supreme Judicial Court | November 23, 2015 The Cyberlaw Clinic filed an amicus brief (PDF) in the Supreme Judicial Court of Massachusetts on behalf of the American Civil Liberties Union of Massachusetts (ACLUM) in Commonwealth v. White, SJC-11917. This is the third case in as many years in which Massachusetts’s highest court has sought the input of amici to help clarify when law enforcement may glean information from a cell phone to advance a criminal investigation. At issue in White is the question of what evidence is required to establish probable cause to seize a cell phone without a warrant – especially in view of an allegation that the cell phone contains a remote wipe feature, raising the specter of its contents being erased if the police don’t immediately seize it. ACLUM argues that the ubiquity of cell phones, their powerful functionality, and their capacity to store enormous amounts of private information are reasons that they merit the very strongest privacy protections as enshrined in the Bill of Rights and the Massachusetts Declaration of Rights. 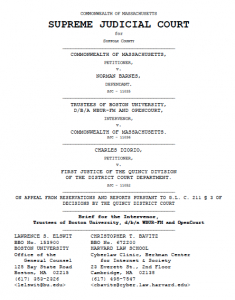 COMMONWEALTH V. LUCAS | SJC-11830 | Mass SJC April 21, 2015 | The Cyberlaw Clinic filed an amicus brief (PDF) in the Supreme Judicial Court of Massachusetts on behalf of the New England First Amendment Coalition, Boston Globe Media Partners, LLC (owners of the Boston Globe), Hearst Television, Inc. (owners of WCVB-TV Channel 5 in Boston), the Massachusetts Newspaper Publishers Association, the New England Newspaper and Press Association, Inc., and the New England Society of Newspaper Editors in Commonwealth v. Lucas, SJC-11830. The case was brought under the Massachusetts false campaign speech law, M.G.L. ch. 56 § 42 (“Section 42”). The brief argues that Section 42 is an unconstitutional restriction on the content of speech, and is also unconstitutionally vague. It describes the robust protection for speech in the realm of political debate, and notes several cases in other jurisdictions where courts struck false campaign speech statutes. As the brief notes, Section 42 presents more serious concerns than the statutes in those cases, as it can potentially extend to any person who makes or publishes a false statement that aids or injures a candidate, whether or not they knew the statement was false, or whether the statement would be understood as false by the reader or viewer. On December 5, 2014 the Cyberlaw Clinic filed an amicus letter in the Supreme Court of California on behalf of Global Voices Advocacy and the Media Legal Defence Initiative in the case of Wineland-Thomson Adventures, Inc. v. Doe 1, No. S222624. In the brief, we argue that California’s anti -SLAPP law, Cal. Code Civ. P. § 425.16, should not allow a defamation plaintiff to survive a motion to strike if their complaint does not specify which statements on the defendant’s website they allege to be defamatory. The brief further argues that courts should not place a lower burden on defamation plaintiffs to prove a valid claim under anti-SLAPP law when suing anonymous online speakers. 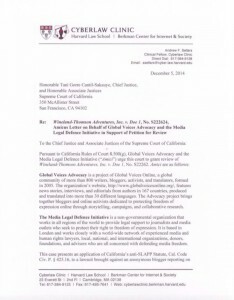 The amicus letter – a special form of brief allowed by the Supreme Court of California when they are considering taking on a case – demonstrates why the decision below can have particularly negative effects on independent online media operating internationally, who rely on Internet services in California to get their message out to the world. 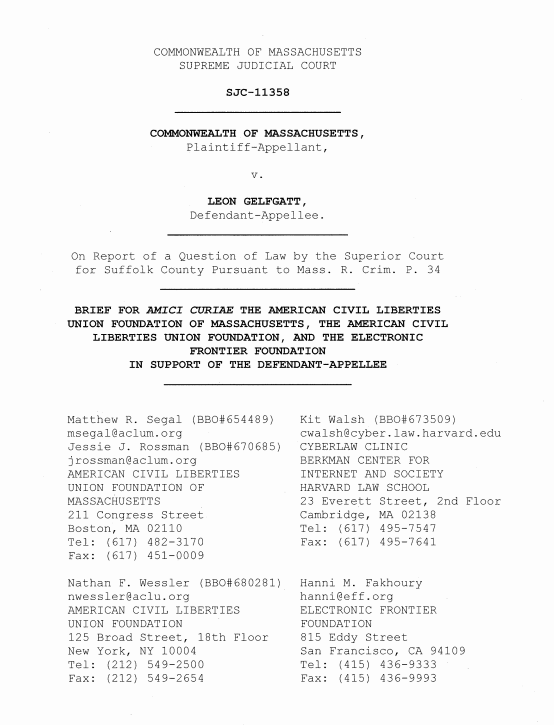 The Cyberlaw Clinic filed an amicus brief in the Supreme Judicial Court on behalf of the American Civil Liberties Union Foundation of Massachusetts, the American Civil Liberties Union Foundation, and the Electronic Frontier Foundation in the case of Commonwealth v. Gelfgatt, SJC No. 11358. 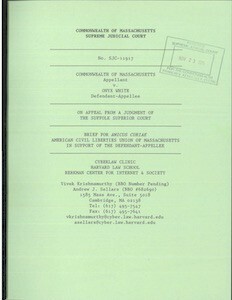 In the brief, we argue that the Fifth Amendment and article 12 of the Massachusetts Declaration of Rights prohibit the government from compelling a defendant to decrypt their electronic data for use against them in criminal proceedings because it involves the kind of testimonial acts protected by constitutional protections against self-incrimination. 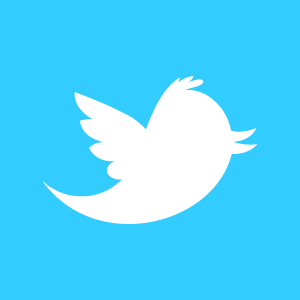 This is the Cyberlaw Clinic’s third brief filed in a series of cases before the Supreme Judicial Court addressing updates to constitutional protections in light of new technologies. 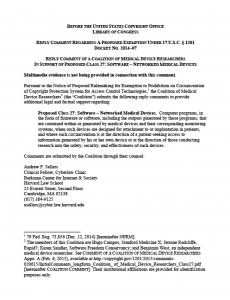 Prior filings on behalf of the Electronic Frontier Foundation concerned warrant requirements for GPS tracking of suspects (Commonwealth v. Rousseau) and historical cell phone location records (Commonwealth v. Augustine). 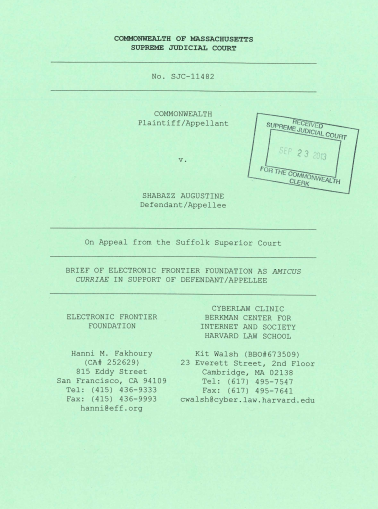 The Cyberlaw Clinic filed an amicus brief (pdf) on behalf of the Electronic Frontier Foundation in the case, Commonwealth v. Augustine, in the Supreme Judicial Court of Massachusetts. The case concerns whether law enforcement officers can obtain someone’s cell phone location data without first obtaining a warrant. The brief argues that the protections of the US and Massachusetts Constitutions prohibit law enforcement from warrantlessly poring over records of people’s movements. Law enforcement officers must demonstrate probable cause to a neutral member of the judicial branch and act according to a valid warrant before such intense intrusion into people’s privacy is appropriate. Without demonstrating reason to believe that a crime has occurred and that the privacy intrusion is likely to provide specified information relating to the crime, the government has not met its burden. TUTEUR v. CROSLEY-CORCORAN | Civil Action No. 13-cv-10159 MBB | D. Mass. 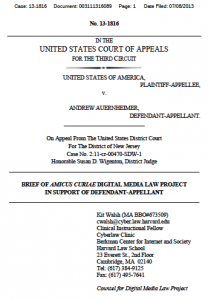 May 1, 2013 | The Cyberlaw Clinic filed this amicus curiae brief (pdf) on behalf of the Electronic Frontier Foundation and the Digital Media Law Project, asking the United States District Court for the District of Massachusetts to join other courts that have addressed the issue and confirm that that copyright owners must consider whether a use is fair before sending a Digital Millennium Copyright Act takedown notice pursuant to Section 512(c) of the Copyright Act. The case concerns a Section 512(f) misrepresentation claim asserted by a plaintiff who alleged that defendant’s 512(c) notice was improper, because plaintiff’s use of defendant’s photograph constituted fair use. The Court issued an order to show cause, suggesting that it might read Section 512(f) very narrowly and require only that those sending takedown notices represent that they own the content at issue. EFF and DMLP expressed concerns that this view of Section 512(f) might undermine its effectiveness in serving to balance users’ rights against those of content owners in the DMCA’s takedown regime. This concern is particularly apparent in cases involving critical speech, where – absent an effective mechanism to challenge wrongful takedowns under Section 512(f) – Section 512(c) may be used improperly to silence a speaker with whom a copyright owner disagrees. SEATON v. TRIPADVISOR | Docket No. 12-6122 | 6th Cir. February 27, 2013 | The Cyberlaw Clinic filed this amicus curiae brief (pdf) on behalf of the Digital Media Law Project, asking the Sixth Circuit to make clear that website operators that aggregate citizen reports and rely on that data to draw conclusions cannot be liable for defamation based on those conclusions. The case concerns TripAdvisor’s 2011 “Dirtiest Hotels in America” list, which was based on travelers’ ratings for cleanliness on TripAdvisor. The proprietor of the hotel identified as the dirtiest in America sued TripAdvisor for defamation and false light, and the U.S. District Court for the Eastern District of Tennessee granted TripAdvisor’s motion to dismiss the claim. In support of TripAdvisor on appeal, the DMLP argued that opinions based on disclosed facts are not defamation under Tennessee law and that protecting such opinions is consistent with the goals of the First Amendment. By disclosing the reviews on which it relied, TripAdvisor enabled its readers to independently assess the rankings, subjecting its conclusions to the marketplace of ideas rather than the courts. COMMONWEALTH OF MASSACHUSETTS v. ROUSSEAU | No. SJC-11227 | Mass. 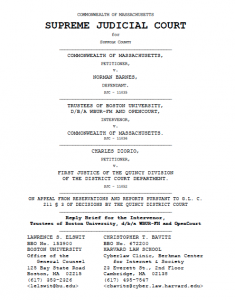 January 22, 2013 | The Cyberlaw Clinic filed this brief on behalf of the Electronic Frontier Foundation, defending the location privacy of the people of Massachusetts in the case of Commonwealth v. Rousseau. The Supreme Judicial Court had called for amicus briefs, asking the question of whether a passenger in a vehicle tracked by GPS had the legal right to challenge the collection of their location data. The brief argues that a passenger does have such standing, primarily because of the passenger’s reasonable expectation that movements will not be tracked by the government without the issuance of a valid warrant. The brief also points out that courts must be vigilant in applying traditional legal safeguards against unreasonable searches and seizures in the context of increasingly invasive surveillance technologies. COMMONWEALTH OF MASSACHUSETTS v. BUSA | Docket No. 1101cr005277 | Boston Muni. Ct. Centr. Div. 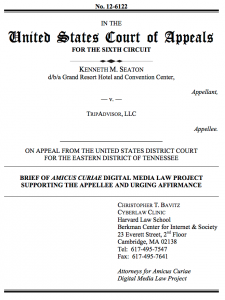 May 21, 2012 | The Cyberlaw Clinic prepared this amicus brief (pdf) on behalf of the Digital Media Law Project in a case that involved a prosecution under Massachusetts’s anti-counterfeiting law, M.G.L. ch. 266 § 147 (“Section 147”). Section 147 punishes one who willfully “manufactures, uses, displays, advertises, distributes, offers for sale, sells or possesses with intent to sell or distribute any item or services bearing or identified by a counterfeit mark,” and it defines “counterfeit mark” to include “any unauthorized freproduction or copy of intellectual property.” The brief argued that Section 147’s definition of counterfeit mark — with no requirement that the mark be likely to cause confusion — criminalizes speech protected by the First Amendment and is thus unconstitutional. JENZABAR, INC. v. LONG BOW GROUP, INC. | No. 2011-P-1533 | Mass. App. 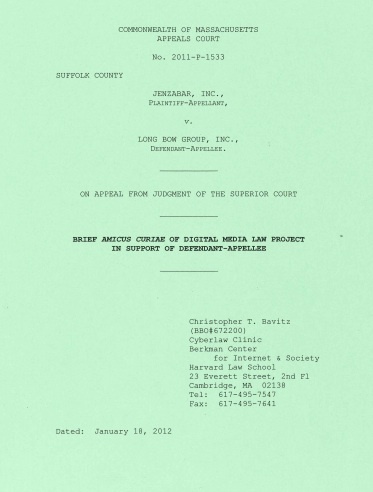 Ct. January 18, 2012 | The Cyberlaw Clinic prepared this amicus brief (pdf) on behalf of the Digital Media Law Project, supporting documentary film production company Long Bow Group, Inc. The case concerns Long Bow’s use of Jenzabar’s name in metadata on web sites containing speech critical of Jenzabar and its founder. 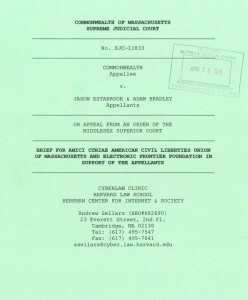 The brief argues that Jenzabar’s attempt to use trademark law to prohibit the use of its name in metadata was an effort to render Long Bow’s protected speech inaccessible on the Internet and was therefore barred by the First Amendment and Article 16 of the Massachusetts Declaration of Rights. AMERICAN CIVIL LIBERTIES UNION OF ILLINOIS v. ANITA ALVAREZ | No. 11-1286 | 7th Cir. April 22, 2011 | This Reporters Committee for Freedom of the Press prepared this amicus brief (pdf) with support from the Cyberlaw Clinic. The brief was submitted to Seventh Circuit on behalf of American Society of News Editors, Association of Capitol Reporters and Editors, Citizen Media Law Project, National Press Photographers Association, Radio Television Digital News Association, Reporters Committee for Freedom of the Press and Society of Professional Journalists. Amici challenged the Illinois Eavesdropping Act, arguing that it is so broad that it inhibits the basic right to gather information. 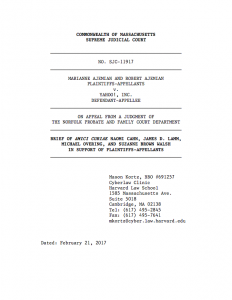 The brief presented many of the arguments set forth in the Clinic’s Glik amicus brief, submitted to the First Circuit in January 2011. GLIK v. CUNNIFFE | No. 10-1764 | 1st Cir. January 23, 2011 | The Cyberlaw Clinic prepared this amicus brief (pdf) with support from Prince Lobel Tye LLP. 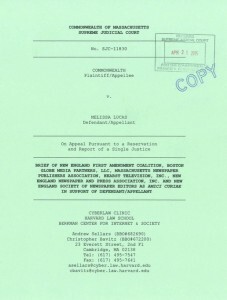 It was submitted to the First Circuit on behalf of the Citizen Media Law Project, joined by Dow Jones & Company, Inc., GateHouse Media, Inc., Globe Newspaper Company, Inc., The Massachusetts Newspaper Publishers Association, Metro Corp., NBC Universal, Inc., New England Newspaper and Press Association, Inc., The New York Times Company, Newspapers of New England, Inc., the Online News Association, and the Reporters Committee for Freedom of the Press. Amici argued that the Massachusetts Wiretap Statute cannot be applied to criminalize recordings where the subjects of those recordings do not reasonably expect their communications to be private. The First Circuit denied permission to file the brief, but its decision in favor of plaintiff Glik echoed many arguments set forth in the Clinic’s brief. BARCLAYS CAPITAL INC. v. THEFLYONTHEWALL.COM | No. 10-1372-CV | 2d Cir. 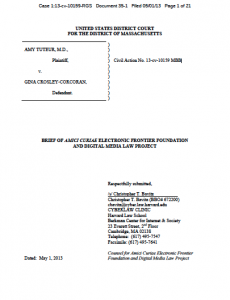 June 21, 2010 | The Cyberlaw Clinic and the Electronic Frontier Foundation prepared this amicus brief (pdf), and it was submitted to the Second Circuit on behalf of Citizen Media Law Project, Electronic Frontier Foundation, and Public Citizen. Amici urged the court to apply First Amendment scrutiny to the “hot news misappropriation” doctrine. The Second Circuit ultimately overturned the district court’s decision on preemption grounds. 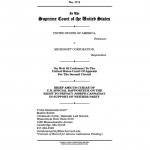 WRIGHT DEVELOPMENT GROUP LLC v. WALSH | No. 08-2783 | Ill. Mar. 3, 2010 | The Cyberlaw Clinic prepared this amicus brief (pdf) with support from local counsel at Winston & Strawn LLP in Chicago, and it was submitted to the Illinois Supreme Court on behalf of Citizen Media Law Project, joined by Public Participation Project, Online News Association, and Chicago Current. Amici urged the court to reject narrow interpretations of the state’s anti-SLAPP statute, known as the Citizen Participation Act. The Court’s decision closely followed reasoning set forth in the Clinic’s brief. THE MORTGAGE SPECIALISTS, INC. v. IMPLODE-EXPLODE HEAVY INDUSTRIES, INC. | No. 2009-0262 | N.H. June 22, 2009 | The Cyberlaw Clinic and Reporters Committee for Freedom of the Press submitted this amicus brief (pdf) with support from local counsel at Drummond Woodsum & MacMahon. It was submitted to the New Hampshire Supreme Court on behalf of Citizen Media Law Project and Reporters Committee for Freedom of the Press. Amici urged the court to defend the First Amendment rights of a website that covers news about the mortgage industry. Public Citizen submitted a separate amicus brief, addressing issues in the case relating to anonymity and unmasking of pseudonymous speakers online. The New Hampshire Supreme Court’s decision in the case directly mirrored many of the arguments advanced in the Clinic’s brief regarding unlawful prior restraints on speech. Maxon v. Ottawa Publ’g Co.
MAXON v. OTTAWA PUBL’G CO. | No. 2008-MR-125 | Ill. App. Ct. Mar. 24, 2009 | The Cyberlaw Clinic prepared this amicus brief (pdf) with support from local counsel at Herbolsheimer Lannon Henson Duncan and Reagan PC. It was submitted to the Illinois Appellate Court for the Third District, an intermediate level appellate court in Illinois, on behalf of Citizen Media Law Project, joined by Gannett Co., Inc., Hearst Corporation, Illinois Press Association, Online News Association, Public Citizen, Reporters Committee for Freedom of the Press, and Tribune Company. Amici asked an Illinois appellate court to protect the rights of anonymous speakers online by imposing procedural safeguards before requiring that their identities be disclosed. DUGAS v. ROBBINS | No. BACV2008-491 | Mass. Sup. Ct. Nov. 7, 2008 | The Cyberlaw Clinic prepared this amicus brief (pdf) and submitted it to the Massachusetts Superior Court in Barnstable on behalf of Citizen Media Law Project, joined by Online News Association, Media Bloggers Association, New England Press Association, and Globe Newspaper Company. 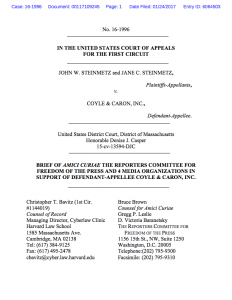 Amici argued that the Massachusetts anti-SLAPP statute applies to all parties who engage in petitioning activities, including members of the news media and professional bloggers. The court denied permission to file the brief. COMMONWEALTH OF MASSACHUSETTS v. KAUPP | NO. SJC-10177 | Mass. 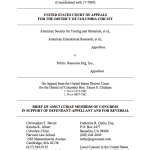 June 27, 2008 | The Cyberlaw Clinic prepared this amicus brief (pdf) on behalf of the National Center of Missing and Exploited Children. The brief supported the Commonwealth’s position in a criminal case, arguing that the seven-day warrant return limit should not apply to forensic analysis of the contents of computers and that general standards of reasonableness adequately protect the timing and conduct of such analysis. COMMONWEALTH OF MASSACHUSETTS v. BRYANT | NO. SJC-09-673 / Mass. App. 2005-P-0375 | Mass. App. Dec. 15, 2005 | The Cyberlaw Clinic prepared this amicus brief (pdf) on behalf of the National Center of Missing and Exploited Children and the American Prosecutors Research Institute. The brief supported the Commonwealth, arguing that the seven-day warrant return limit should not apply to forensic analysis of the contents of computers and that general reasonableness standards protect timing and conduct of such analysis. 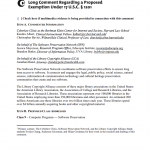 COMMENT OF SOFTWARE PRESERVATION NETWORK AND LIBRARY COPYRIGHT ALLIANCE FOR EXEMPTION TO PROHIBITION ON CIRCUMVENTION OF COPYRIGHT PROTECTION SYSTEMS FOR ACCESS CONTROL TECHNOLOGIES | DMCA Anti-Circumvention Exemption Request | December 2017 | The Cyberlaw Clinic submitted a comment on behalf of the Software Preservation Network and Library Copyright Alliance seeking an exemption to the prohibitions on circumvention set forth in Section 1201 of the Copyright Act. The requested exemption would allow libraries, archives, museums, and other cultural heritage institutions to circumvent technological protection measures on lawfully acquired computer programs for the purposes of preserving computer programs and computer program-dependent materials. UNITED STATES COPYRIGHT OFFICE, LIBRARY OF CONGRESS COMMENT REGARDING SECTION 512 STUDY | DOCKET NO. 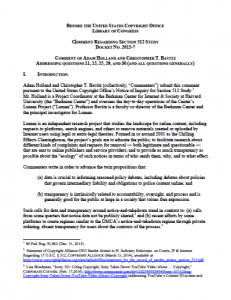 2015-7 | COMMENT OF ADAM HOLLAND AND CHRISTOPHER T. BAVITZ ADDRESSING QUESTIONS 11, 15, 25, 29, AND 30 (AND ALL QUESTIONS GENERALLY) | APRIL 1, 2016 | The Cyberlaw Clinic filed this comment on behalf of Adam Holland and Christopher Bavitz, who work on the Berkman Center for Internet & Society’s Lumen project, in connection with the United States Copyright Office’s study concerning Section 512 of the Copyright Act and the safe harbor provisions of the Digital Millennium Copyright Act. The comment highlighted the need for complex policy determinations – like those involving liability and immunity of online platforms – to be based on data and evidence of the sort collected and shared by Lumen. The comment also underscored the value of transparency about takedowns in facilitating clear and manageable processes for all parties in the takedown regime and urged the Copyright Office to encourage further data-sharing to support any efforts to balance the interests of rightsholders, platforms, and users in this space. Harvard Law School students Shoshana Schoenfeld and Jonathan Luebbers, enrolled in the Clinic during the spring term 2016, contributed significantly to the comment. 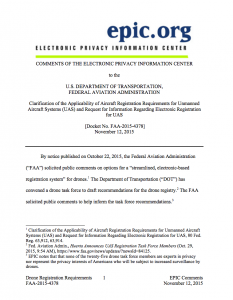 C OMMENTS OF THE ELECTRONIC PRIVACY INFORMATION CENTER TO THE UNITED STATES DEPARTMENT OF TRANSPORTATION, FEDERAL AVIATION ADMINISTRATION | Clarification of the Applicability of Aircraft Registration Requirements for Unmanned Aircraft Systems (UAS) and Request for Information Regarding Electronic Registration for UAS | Docket No. 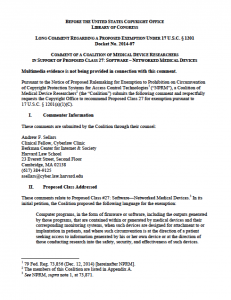 FAA-2015-4378 | November 12, 2015 | Fall 2015 Cyberlaw Clinic students Katherine Kwong and Sophia Choi contributed to the Electronic Privacy Information Center’s November 12, 2015 comments, submitted to the Federal Aviation Administration in connection with an inquiry regarding registration of Unmanned Aircraft Systems. In the comments, EPIC expressed support for registration but raised concerns about public availability of personal information of registrants. The FAA’s Interim Final Rule on this subject, issued on December 16, 2015, cited EPIC’s comments extensively. DISTRICT ATTORNEY FOR THE NORFOLK DISTRICT v. JUSTICES OF THE QUINCY DISTRICT COURT; ANTHONY BENEDETTI, CHIEF COUNSEL, COMMITTEE FOR PUBLIC COUNSEL SERVICES v. JUSTICES OF THE QUINCY DIVISION OF THE DISTRICT COURT DEPARTMENT OF THE TRIAL COURT OF THE COMMONWEALTH | Nos. SJ-2012-306, SJ-2012-308 | Mass. July 27, 2012 | The Cyberlaw Clinic and co-counsel at Boston University’s Office of General Counsel submitted this memorandum to Single Justice Botsford of the Mass SJC on behalf of WBUR’s OpenCourt project in connection with two related actions commenced by the Norfolk District Attorney and the Committee for Public Counsel Services. The cases challenged the right and ability of the Justices of the Quincy District Court to permit OpenCourt to livestream, record, and archive trial proceedings in Quincy. Justice Botsford heard oral argument on August 9, 2012 from representatives of the Norfolk DA and CPCS, a representative from the Massachusetts Attorney General’s office (appearing on behalf of the Quincy Justices), and Cyberlaw Clinic Assistant Director Christopher Bavitz (appearing for OpenCourt). 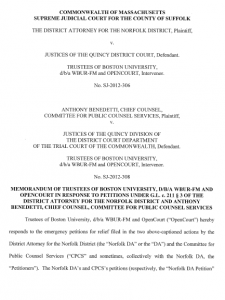 The Court issued a Memorandum and Judgment on August 14, 2012, ruling in favor of the Justices of the Quincy District Court and permitting OpenCourt to move forward with its coverage trial proceedings in Quincy. 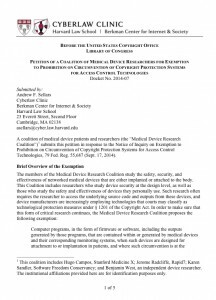 IN RE: EX PARTE REEXAMINATION OF PATENT NO. 6,264,560 | Request for Reexamination of Patent for “Method and System for Playing Games on a Network” | January 31, 2008 | The Electronic Frontier Foundation submitted this patent reexamination request (pdf) with significant support from the Cyberlaw Clinic, raising questions of patentability based on prior art patents and printed publications not previously cited by or presented to the Patent and Trademark Office.